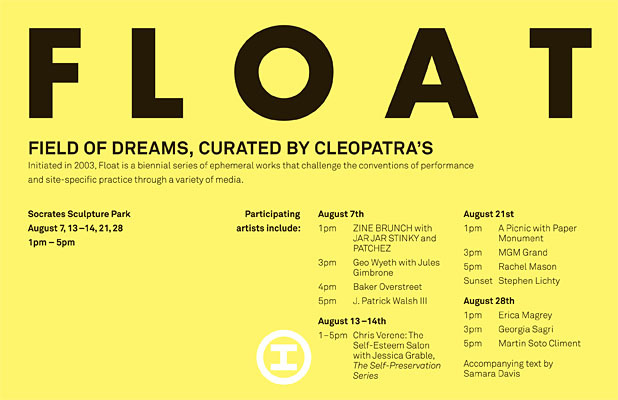 Socrates Sculpture Park is pleased to announce the opening of FLOAT, the 5th biennial series of ephemeral and interactive artworks and musical performances. 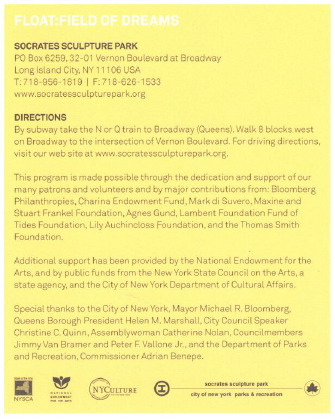 Titled “Field of Dreams”, the 2011 installment will be guest curated by Cleopatra’s and will feature nine artists and artist collaborators who are creating site-specific work for installation throughout the Park. FLOAT: Field of Dreams will take place from 1-5pm every Sunday in August (7, 14, 21, and 28), as well as on Friday, August 12, and Saturday, August 13. The series will be free and open to the public and all performances will be held rain or shine (For the latest weather updates, visit www.socratessculpturepark.org or follow www.twitter.com/ssp- weatherwatch). A complete schedule is listed below. Cleopatra’s (http://www.cleopatras.us/) was co-founded by Bridget K. Finn, Bridget Donahue, Erin Somerville, and Kate McNamara in June of 2008. Cleopatra’s works collaboratively with artists, curators, writers, designers and musicians on projects that create or further connections between artists’ communities, studios, galleries and institutions. The aim of Cleopatra’s is to advance ideas informed by both individual and collective creative perspectives, and to disseminate them among a broad and diverse audience. Cleopatra’s non-commercial projects are realized in a storefront gallery in Greenpoint, Brooklyn and also take form as off-site, public programs, events and print publications. 1PM Jar Jar Stinky & Patchez present ZINE BRUNCH! Artists will make magazines and bring them in for trade or donation. Presented by Jory Rabinovitz and Patrick Walsh. 3PM Geo Wyeth and Jules Gimbrone: Crude Imitation is a performance meditation on the truths that happen in the moment to moment clamoring for the real thing. Gimbrone’s composed musical sets based on the life of Joan of Arc are grafted onto a new context of instruments and textures. Every Thing On Stage tries to be the body and fails in Wyeth’s Arguments and Meditations for Saxophone and Voice. Two people share a flute. Some Person tells a story and all the Other Things On Stage read lips. A deaf cello and a mute saxophone. Thank you for not listening and shouting I LOVE YOU like you know me all up in my face. 4PM Baker Overstreet Overstreet will be performing under his stage name, June, in a musical homage to the moon. In front of a dazzling backdrop that transports one to the heavens, he will be joined by a small rag tag gang of supporting players to form what Overstreet refers to as a “junkyard band”. 5PM J. Patrick Walsh III: For this performance, Walsh has cast a backpack from his high school years in aluminum, and plans to drive a steamroller over the bag, forcing the object into the earth at Socrates sculpture park. Inspired by the Park’s former title as a landfill, Walsh’s performance creates a setting in which heavy machinery interacts with memory to produce an object set for erasure. Active performance Hours of The Self-Esteem Salon are 12-8PM. Chris Verene: The Self-Esteem Salon with Jessica Grable, “The Self-Preservation Series”: New York artist, Chris Verene, presents a new installation of his ongoing, live-action performance artwork cycle, The Self-Esteem Salon, established in 1996. For Socrates Sculpture Park, Verene teams up with friend, performance artist and sculptor, Jessica Grable, to create the largest version of the performance ever staged, entitled The Self-Esteem Salon with Jessica Grable: The Self-Preservation Series. Verene and Grable are working together to build an ensemble of plant life and costumes emphasizing the human need for self-preservation, a custom topiary garden made from cultivated invasive plant species, a 40-foot yurt sanctuary to help strangers/participants make a sincere and lasting change in their lives. The project is something like a day spa, a short time spent in therapy that will have positive results on one’s personal life. The artist and his staff of “Group Facilitators” welcome visitors, clients and audience members throughout the duration of the piece, offering a variety of public and private experiences including cognitive therapy, massage (touch and non-touch), costume construction, audio therapy, and other activities that the artist has found to raise clients’ self-esteem over the past thirteen years of practice. For more information, please visit chrisverene.com. 3PM MGM Grand MGM Grand will perform Oneness: Making It With Love. MGM Grand is a dance-centered art group with members Jmy Leary, Piage Martin and Biba Bell. WONK! WONK!